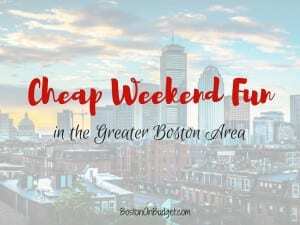 Cheap Weekend Fun in Boston for September 15-16, 2018! Boston Local Food Festival: Sunday, September 16, 2018 on the Greenway. Enjoy this free outdoor food festival featuring farmers, local restaurants, food trucks, and many more organizations focusing on healthy foods and healthy living. Boston Social Fitness Festival: Saturday, September 15, 2018 at City Hall Plaza. Enjoy this day-long fitness festival to help Boston get moving with a lot of free fitness opportunities. South Boston Street Festival: Saturday, September 15, 2018 in South Boston from 11-4PM. Enjoy live entertainment, great food, local merchants, children activities, and much more! South Street Diner Customer Appreciation Day: Sunday, September 16, 2018 from 2-6PM at the South Street Diner. Head to the South Street Diner for their annual Customer Appreciation Day with free pony rides, music, free burgers and hot dogs, and more. Roslindale Porch Fest: Saturday, September 15, 2018 from 1:30-5:30PM in Roslindale. Head to the porches of musicians in Roslindale for a day full of music and fun. Greek Fest 2018: September 14-16, 2018. Head to Brookline to share in the tastes and sounds of Greece. South End Open Studios: September 15-16, 2017 from 11-6PM. Over 200 local artists will be sharing their artwork in the South End for this once a year, back-stage opportunity open to the public.